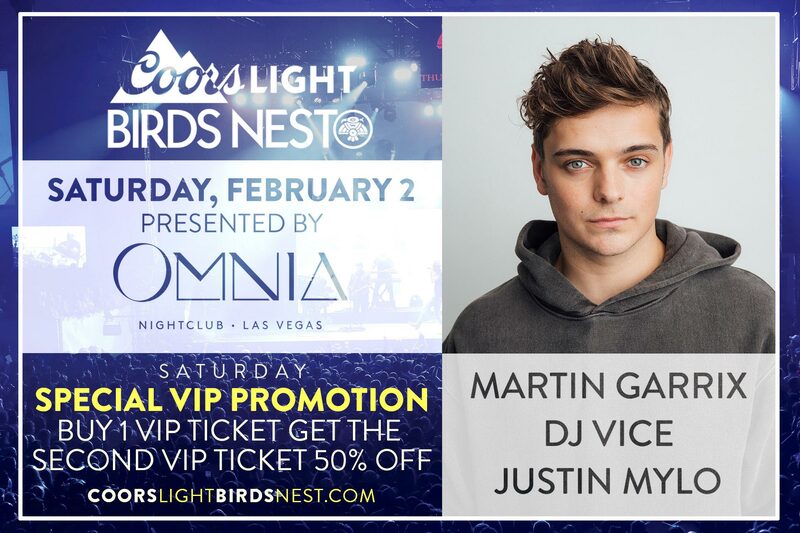 The Coors Light Birds Nest – the popular entertainment venue at the Waste Management Phoenix Open – announced today it is offering a limited buy one VIP, get one VIP 50 percent off to Saturday’s headline event Presented by Omnia Nightclub to see the No. 1 DJ in the world, Martin Garrix; along with DJ Vice and Justin Mylo. This special seven day FLASH promotion begins Thursday, January 17 at 8 a.m., and will run through Wednesday, January 23. VIP tickets start at $300 – The second ticket, when purchasing two, will cost $150. Tickets can be purchased at www.CoorsLightBirdsNest.com. Coors Light Birds Nest VIP tickets provide exclusive access to the Jameson VIP area where guests are treated to a complimentary catered dinner, complimentary drinks and access to a newly redesigned premium viewing area for the shows. Dutch DJ Garrix gained fame through his solo release “Animals” which was released in June of 2013 on Dutch record label Spinnin’ Records. The song became a hit in a number of countries in Europe, and allowed Garrix to become the youngest person to reach No. 1 on Beatport – an American electronic music-oriented online music store.